A a kid from Western PA, I grew up singing songs written in the 20's and 30's ... What fun!! In my teenage years I was fortunate enough to meet Arthur DeSimone (charismatic piano player, mentor, angel). I followed him through the lounges, sang at his concerts, and thanks to him my knowledge of the old songs grew and grew. Later on I found myself writing songs, surely inspired by those old classics. 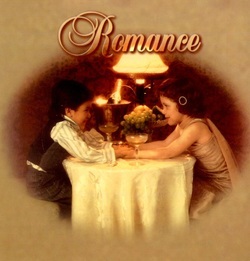 The idea for "ROMANCE"came after hearing renditions of those old songs melodically changed. I called Tony, Jim Dennis and Kenny and we all met at Jack's Tracks Recording Studio. And there you have it ..."ROMANCE WAS BORN!" writer-spirits who have moved so many. "Pop in its purest sense, meaning the old-time Tin Pan Alley kind. (of "When I Dream" fame) doing her saloon chanteuse thing with some of Music Row's finest. The whole thing is simply adorable."